Huge and rich, a treasure-house. With sentences like elaborate jewelry, too -- but not so bad as other Persian historians, the intro says, whose rhetoric can become hard to disentangle. I enjoy how he intersperses (short) verses, from sources we can't even trace. The metaphor and manner of speech you have both in his prose and in these odd lines of poetry, give you glimpses into the mentality and the tropes they thought in. Unfortunately he has little on the early life of Genghis. Even so, his potted history, 'On the condition of the Mongols before the time of Chingiz Khan' and 'Chingiz Khan's rise' is told with vim, and a sense of the sheer unexpectedness of that history. Juvaini's astonishment comes through, and already he begins to ask the questions: how did this happen, why did this happen? Contingency, God? He has the most catastrophic events to grapple with -- and at the time he wrote, he like his father before him were high in the service of the Mongol government. I don't think he's either for or against the Mongols -- it isn't that simple. He has and uses free speech to paint the catastrophe. But he isn't embittered beyond objectivity, like another Persian historian who escaped the Mongol onset and wrote in an entirely anti-Mongol vein from India: Juzjani. Certain chapters on the war follow insane events, such as 'Of Merv and the fate thereof.' 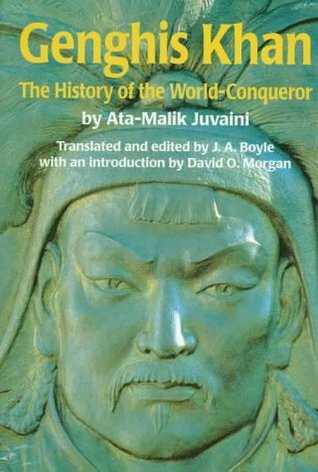 Between the Mongols, the inhabitants, the neighbours and the putative Sultan who's meant to defend them... as insane a story as you can hope to find in time of war. Juvaini does vivid portraits. For instance, 'Of the remaining events in the life of the Sultan Muhammad of happy memory and the confusion of his affairs.' Muhammad, Khorazm-Shah, was a disaster for his people -- Juvaini's people -- and Juvaini tells his pathetic story with sympathy and criticism too, and simply with a story-teller's verve. Later, the portrait of Chingiz' son and successor: he piles up the incidents to be told of him, whose main trait was a generosity gone crazy. Generosity was a trait admired in kings, maybe the number one kingly trait, in both cultures here, and it's funny to read about him splashing around the Mongols' newfound fabulous wealth, and sensible heads attempting to save a little of the treasury. These are tidbits merely. It's a treasure-house of a book, like I say. Legendary beginnings of Uighur kingship -- kings grown from trees? In here. The famous Sorqotani Beki, and not just the politics but the social context that seemed just as important to Juvaini; her deeds in patronage of religions. Plural; she was Christian, but Juvaini likes her because she fostered Islam too. Sign into Goodreads to see if any of your friends have read Genghis Khan. I'd love to read this, but it' too expensive to buy even used. I've just gone to see. Ouch. I have a distinct memory I was happy with the price. It must have become rare. I'd swear I bought for nearer fifty than a hundred. I've got it on my wish list so can keep looking. DO you know anything about the author? Oh! I just looked him up. Yeah, can supply any info you need! --I've had mine for years, I only just got around to a review.